^ Burma death toll jumps to 78,000. BBC News. 2008年5月16日 [2008-06-06]. ^ U.S. envoy: Myanmar deaths may top 100,000. CNN. 2008年5月7日 [2008-05-07]. ^ 印度气象局. Depression over southeast Bay of Bengal. 2008 [2008-05-02]. ^ 印度气象局. Deep Depression over southeast and adjoining Southwest Bay of Bengal. 2008 [2008-05-02]. ^ 联合台风警报中心. Tropical Cyclone 01B Warning NR 001. 2008 [2008-05-02]. ^ 联合台风警报中心. Tropical Cyclone 01B Warning NR 002. 2008 [2008-05-02]. ^ 9.0 9.1 印度气象局. Cyclonic storm “NARGIS” over southwest and adjoining southeast and west central Bay of Bengal. 2008 [2008-05-02]. ^ 联合台风警报中心. Cyclone Nargis Warning NR 004. 2008 [2008-05-02]. ^ 印度气象局. Severe Cyclonic storm “NARGIS” over southwest and adjoining southeast and west central Bay of Bengal. 2008 [2008-05-02]. ^ 印度气象局. 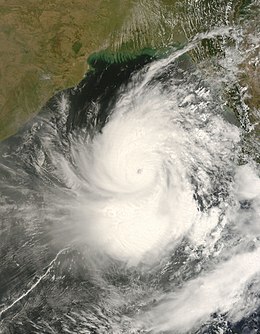 Very Severe Cyclonic storm “NARGIS” over westcentral and adjoining southwest and southeast Bay of Bengal. 2008 [2008-05-02]. ^ Sify News. Cyclone Nargis triggers fears in Tamil Nadu. 2008-04-28 [2008-05-03]. ^ The Daily Star. Cyclone Nargis poised to strike in 4-5 days. 2008-04-29 [2008-05-03]. ^ 印度气象局. May 2, 2008 Shipping Bulletin for Met. Area VIII North of Equator. 2008 [2008-05-02]. ^ 印度气象局. Tropical Storm “Nargis" Advisory No. Forty-One Issued At 0200 UTC of 3 May, 2008 Based on 0000 UTC Charts of 3 May, 2008. 2008 [2008-05-02]. ^ 29.0 29.1 Daily Mirror. Floods leave thousands homeless. 2008-04-30 [2008-05-03]. （原始内容存档于2008-05-09）. ^ Lakshmi de Silva. Over 35,000 affected by floods, landslides. Upali Newspapers Limited. 2008-04-30 [2008-05-03]. ^ Press Trust of India. Orissa heat deaths rise to eight as cyclonic storm forms over Bay. 2008-04-28 [2008-05-03]. ^ Steve Herman. 政府下達孟國農夫勿因颱風恐慌(英語). 美國之音. 2008-04-29 [2008-05-03]. ^ Staff Writer. Aid starting to trickle into Burma: agencies. CTV. May 6, 2008 [2008-05-06]. ^ Tony Eastley. Australia pledges $3m relief to Burma. ABC. 2008年5月7日 [2008-05-07]. ^ Brunei to send relief supplies for Myanmar cyclone-hit. 《文莱时报》. 2008-05-08 [2008-05-08]. ^ Finland to send emergency assistance to Myanmar. 芬兰外交部. 2008-05-07 [2008-05-07]. ^ Statement of FM Ms. Bakoyannis regarding provision of humanitarian aid to Myanmar/Burma. Greek Ministry of Foreign Affairs. 2008-05-08 [2008-05-08]. ^ Aid to Myanmar tripled. Newstalk ]]. 2008-05-08 [2008-05-09]. ^ Norway prepared to provide NOK 10 million for cyclone victims in Burma/Myanmar. 挪威外交部. 2008-05-08 [2008-05-08]. ^ Usvojen memorandum o budžetu. B92. 2008-05-15 [2008-08-07]. ^ Singapore sends off first batch of relief supplies to Myanmar. Channel NewsAsia. 2008-05-07 [2008-05-07]. ^ Ministry of Foreign Affairs grants a financial assistance in the amount of 100,000 USD to Myanmar, following “Cyclone Nargis". Thai Ministry of Foreign Affairs. 2008-05-06 [2008-05-06]. （原始内容存档于2008-05-09）. ^ UK pledges extra £12m in aid for Burma. BBC. 2008年5月15日 [2008-05-07].